Christopher J. 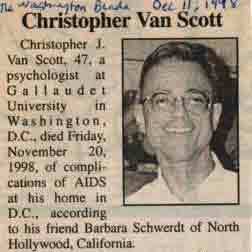 Van Scott, 47, a psychologist at Gallaudet University in Washington, D.C. died Friday, November 20, 1998, of complications of AIDS at his home in D.C., according to his friend Barbara Schwerdt of North Hollywood, California. Van Scott was born Nov. 15, 1951, in Chicago, and grew up in Derwood, Md. He earned a bachelor’s degree in theater management from the University of Wisconsin in 1980. After college graduation, he came to D.C., where, Schwerdt said, his love for the theater led him to a position at the Kennedy Center. He became interested in deafness and completed a degree in sign language interpreting at Gallaudet University in 1985. Van Scott and Schwerdt then moved to Southern California, where he earned a second bachelor’s degree in psychology from California State University at Northridge in the late 1980s. While studying at Northridge, he worked at the National Center on Deafness as a tutor to deaf students. He continued his education by entering the doctoral program at the California School of Professional Psychology in Southern California. Van Scott returned to Gallaudet in 1992 and worked as a psychologist in the Mental Health Center, where, colleagues said, he made “innovative contributions” to group and student training programs. After his retirement in 1997, he divided his time between his home in D.C. and the Chesapeake Bay shore, where he enjoyed flower and vegetable gardening. He is survived by Dr. Eugene and Mary Van Scott, his younger brothers, Stephen and David Van Scott, two sisters-in-law, and two nieces, all of the Philadelphia area; and numerous friends. He was surrounded by friends and family at the time of his death. His remains were cremated, and private memorial services will be held in Church Creek, Maryland. In lieu of flowers, contributions in Van Scott’s memory may be made to the Whitman-Walker Clinic, 1407 S St., NW, Washington, DC 20009.